Bournemouth manager Eddie Howe (left) and Burnley manager Sean Dyche shake hands before the Premier League match at Turf Moor, Burnley. PRESS ASSOCIATION Photo. Picture date: Saturday September 22, 2018. See PA story SOCCER Burnley. Photo credit should read: Anthony Devlin/PA Wire. RESTRICTIONS: EDITORIAL USE ONLY No use with unauthorised audio, video, data, fixture lists, club/league logos or "live" services. Online in-match use limited to 120 images, no video emulation. No use in betting, games or single club/league/player publications. Two of the brightest and most valued English managers will share a touchline at the Vitality Stadium tomorrow, according to Clarets defender Ben Mee. The 29-year-old centre back has played under both Sean Dyche and AFC Bournemouth boss Eddie Howe during his time at Turf Moor and is greatly appreciative for the impact they’ve had on his career. Mee was one of the first players through the door in the summer of 2011 ahead of Howe’s first full season in charge at Burnley, arriving on loan from Manchester City just weeks before being joined by Kieran Trippier. The defender, who made his move a permanent one in January 2012, made 44 appearances for the Cherries chief until a 4-3 loss to Crystal Palace at Selhurst Park in the Championship prompted a return to Dorset. “We had a fantastic season last year to finish seventh and they’re doing really well this season,” said Mee. “They’re two top English managers. “They’ve contributed massively. They both play different styles of football but I don’t think there’s a right way to play football. It’s however you perceive it. I’m really grateful to them both. Saturday’s 2-0 triumph over Wolves marked Dyche’s 300th game in charge of the Clarets since becoming Howe’s successor almost six-and-a-half years ago. 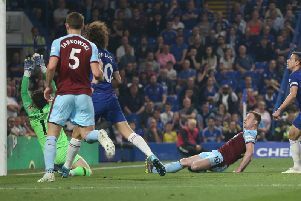 In a quirk of fate the result provided many parallels to Dyche’s first game at the helm where goals from Martin Paterson and Charlie Austin had secured an identical scoreline against the same opposition. And Mee was the only surviving member from that matchday squad on November 3rd, 2012, to feature in the most recent fixture. “It’s funny how it works out and it was nice to get the win for his 300th game,” said Mee, who has played 237 times for Dyche. “We’ll celebrate that but we’re looking forward to the next game now. “It moves on and it’s changed a lot at the club. It’s a fantastic testament to what’s been going on here for the last 300 games. The trip to the South Coast marks the start of a crucial week for the Clarets, who effectively face a shoot-out for Premier League survival at home to Cardiff City on April 13th. After opening up a five-point cushion over the Bluebirds, Mee said: “The next two games are massive. We go to Bournemouth with a bit of confidence now, belief and we can play with a bit more freedom. It takes that pressure off us. Then there’s a massive game back here after that.